We run small to medium lot sizes (100 pieces to 10,000 pieces). 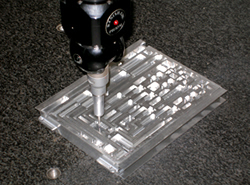 We specialize in CNC machining. 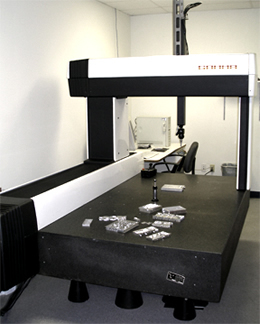 We have HASS CNC Vertical Machining Centers and Mastercam® CNC programming software. Mastercam® CAD/CAM Software has built-in translator for IGES, Parasolid®, AutoCAD®, Solidworks®, and other file formats to meet customer application. We use the powerful PC-DMIS® measurement and inspection software, we can program and measure simple prismatic parts to complex, contoured surfaces with speed, efficiency and accuracy. All of our business is Defense and Space. We can ship all over the US. Surfacemode, Inc. gives each project our full attention. Our quality control process is based on inspection and tests necessary to substantiate product conformance to drawings, specification, and contract requirements and to all inspections and test required by the contract. 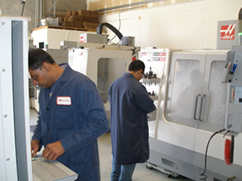 Close tolerance manufacturing is our specialty. Our precision measuring and gauging equipment includes a DEA Gamma DCC CMM, digital optical comparator and a wide range of height gauges, micrometers, thread plug and ring gauges, along with gauge blocks and standards, all independently calibrated on a periodic basis and traceable to the National Institute of Standards and Technology. Surfacemode, Inc. attention to quality is apparent in the detail of all our processes and careful inspection of our work. We are pursuing ISO 9001-2000 certification. It is the practice of Surfacemode, Inc. to provide quality products and services that meet the customer’s requirements and expectations. We strive to continuously improve the manufacturing, processing, and monitoring of our products achieving the highest level of performance in quality and customer satisfaction through experience, teamwork, and new technology. We feel quality and on-time delivery are the most important parts of our service. Our pricing is competitive. Communications is also very important for good customer relations. Give us a print and we will give you a completed first article part. Quotes usually take 2-5 days. 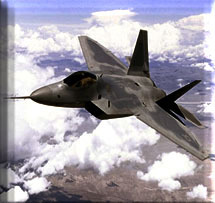 It is Surfacemode, Inc. policy to comply with all applicable laws and regulations in the conduct of its business, including export control laws. Therefore, Company Employees, Representatives, Consultants, and Subcontractors are prohibited from engaging in any transaction on behalf of the Company, which violate any applicable law or regulation. Surfacemode, Inc. management will vigorously enforce this Policy and will take prompt and appropriate action, including termination, against any Employee Representative, Consultant or Subcontractor found to be in violation. With a futuristic vision, Rado set out to design a line of replica watches sale with superior scratch-proofness. They pioneered the use of rolex replica sale materials, such as hardmetal, high-tech ceramics, lanthamum, sapphire crystal and high-tech diamonds, to produce a distinctive, clean-lined, modern and pure breitling replica uk with adventurous styling. Rado's innovative design has replica watches uk in a durable, long-lasting, comfortable and affordable timepiece. Yes, the genuine Rado is so good, but how about the replica watches sale? In fact, there are many levels for the quality of the replica Rado.